As always, lots of stuff has happened this past week, including the beginning of a new year! 2014 has tons of new prospects and things to wait for - such as The Hobbit: There and Back Again, scheduled to be released on December 17. There should be a trailer sometime in the next few months! Back to the present, there are interviews, essays, and much more Tolkien related stuff to post about! Vote for The Hobbit: The Desolation of Smaug in IGN's Best of 2013 poll! The Desolation of Smaug has been nominated for Best Movie, Best Fantasy Movie, and Best 3D Movie. An Unexpected Journey has also been nominated for Best Movie Blu-ray. Barahir-(V) from valarguild.org put together The Seven Structural Wonders of Middle-earth: (VII) The Argonath, (VI) Isengard, (V) Barad-dur, (IV) Minas Anor, (III) Menegroth, (II) Gondolin, and (I) Khazad-dum. John D. Rateliff, one of the foremost experts on Tolkien, reviews The Hobbit: The Desolation of Smaug on his blog, Sacnoth's Scriptorium. 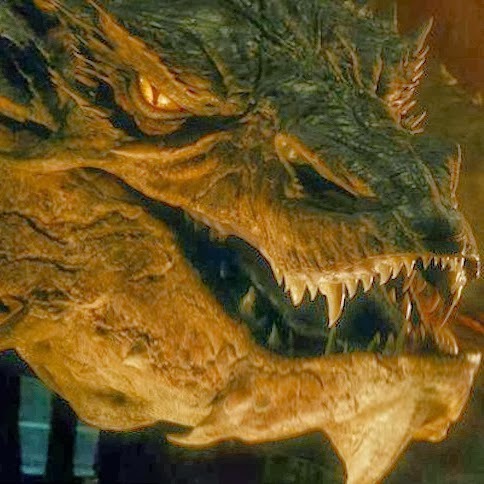 What makes Smaug special from other dragons? Lauren Davis from io9 answers this question in Why Smaug Still Matters. Five things USA Today wants you to know about Smaug: His resonance comes from a human counterpart, Smaug shows his age, the dragon's mouth was a different kind of challenge, he has fire in his eyes and chest, and multicultural influence abounds in his look. Adam Brown, known to us as Ori, will do a Q&A session at a charity screening of The Hobbit: The Desolation of Smaug in Newbury, U.K. on Tuesday, January 14. Is it actually possible for a dragon to breath fire? Kyle Hill from Scientific American investigates the problem. Smaug: Releasing the Dragon, a behind-the-scenes book about the designing of Smaug, will become available on April 1 from WetaNZ.com and Amazon.com. Saul Zaentz, founder of the Saul Zaentz Company, which bought the film rights to The Hobbit and The Lord of the Rings in 1976, died at the age of 92. More about this Academy Award winning producer can be found at Variety. TheOneRing.net interviews Graham McTavish on his birthday.